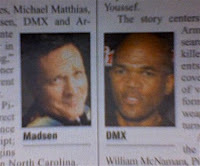 But the folks at Variety didn’t publish a photo of DMX. They published a photo of DMC... as in Run-DMC... as in Darryl McDaniels. And that’s our Misidentified Black Person of the Week. But what does Daniels believe "Barack" is Obama's real first name? DMX, DMC. You say potato, I say WTF...hee hee! ...snap! where are my Adidas? UMB, you're on the job! Snap! "Where my dogs at?" I would never confuse, say, Ashlee Simpson with Ashley Judd; or Ashlee with her sister Jessica, even. Gah!